This verse from Jeremiah has long been one of my favorites. In the midst of trial, persecution, slavery, and a whole host of other repercussions towards the Nation of Israel because of their disobedience - God still had an expected end planned for them. Other translations say it like this "a hope and a future." 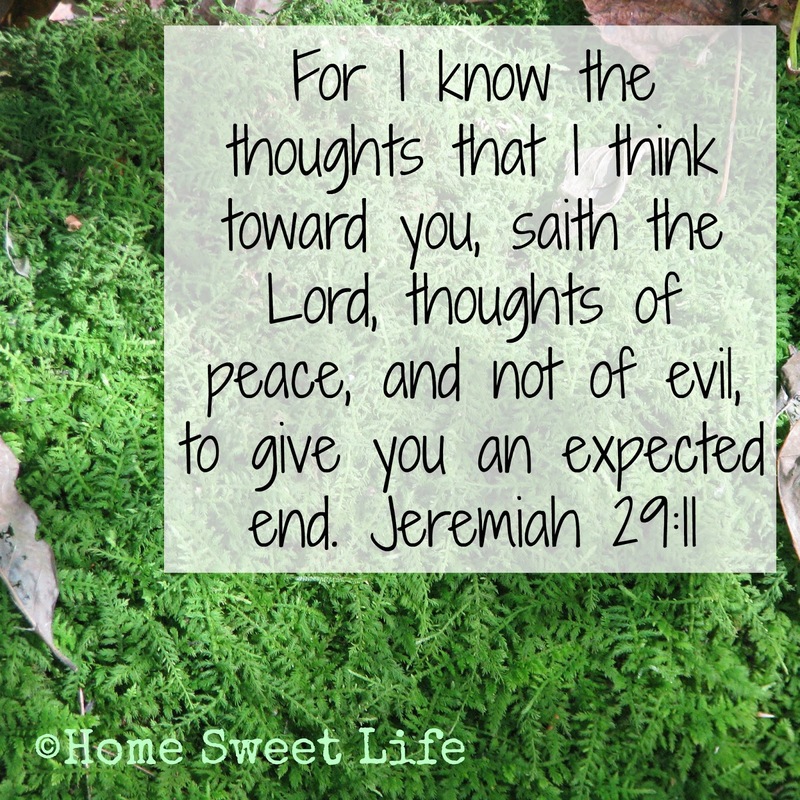 With all of the coming (and ongoing) judgments that they were facing, Jeremiah still had this hope to hold out to the Israelites. That hope is still held out for us today. God can make wonderful, glorious ends to our rotten no good, horrible days. It takes God's perspective, and God's power. We cannot get ourselves out of our big messes, we need Him. God works in our lives so that we may bring Him glory. Just like the little plants in the picture above, our lives are full of intricate details. God sees each detail, He controls those details, He created us. Stand in awe at how much the Father loves us, and how intimately involved He is in our lives ~ thoughts of peace. Whatever today's joy or struggle, know that God is right there with you, working it all out to give you an expected end. May your day bring Him glory. My friend Brenda has a Verse of the Week Linkup over at Counting Pinecones. 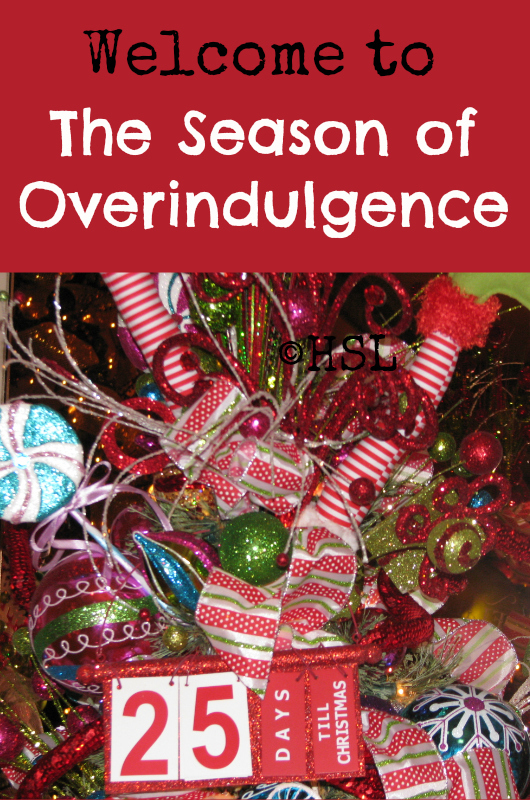 Welcome to the Season of Overindulgence. It used to be called the Holidays, but the stark reality is, most Americans have forgotten about the real meanings of Thanksgiving and Christmas and now just look forward to buying more and more stuff and eating too much food. Black Friday sales start the Monday or Tuesday before Thanksgiving, and you can buy anything anyone might want in person or online at almost any hour of any day between now and . . . well, frankly, forever. How did the American populous forget about the reasons we used to celebrate? Do today's children even know about the pilgrims, about the Civil War, about anything in our history before the advent of MTV or the Disney channel? Where have we lost our collective past, dare I say our collective soul? When I was growing up, stores closed for Thanksgiving, and for Christmas. Everyone understood that you needed to go buy your Thanksgiving food by at least Wednesday evening, and you needed to gas up the car on your way home. Even as late as the 1990's everything closed by 6 p.m. on Christmas Eve. If you didn't plan ahead you did without. Life was just as complicated back then, yet the general populace still realized the way to respect other people was to give them a day off of work for Thanksgiving and for Christmas. Doctors, nurses, firefighters, policemen still worked (on a rotating schedule ) ~ yet people treated them with respect and honor. They often took a plate of cookies to the firehouse, dropped a basket of fruit off at the ER for the nurses and paramedics, or at least said a simple "Thank You." They understood sacrifice a little better than we do today. Go ahead, call me old-fashioned ~ I can take it. I've seen a disturbing trend in eating as well ~ instead of eating a meal and then having a dessert or two, many do not even eat the holiday meal, they just head for the sweets. Instead of savoring a sweet, we simply expect it as our due. We don't eat to fuel our bodies anymore, we eat to feed our desires. We are making ourselves ill, not because we can't access or afford food, but because we choose to NOT eat what our bodies need in favor of a quick sugar high. We've become a society of selfish, self-centered, over-indulged whiners. We have forgotten what thankfulness is. Too often we think if we don't have EVERYTHING, then we don't have anything of value. We have taken materialism and gluttony to the extreme. Stop what you're doing right now and think about what you ate at your last meal...can you remember? If your last meal was today, then you are blessed, and you should be thankful. I know I've been swept up into the trap of greed and gluttony recently myself. I want to get back to a heart and life that is full of grace and thankfulness. I want to focus on the real reason we celebrate Christmas - Christ! If you're struggling with feelings of inadequacy as a parent because you can't give your children everything they see on tv, or feeling like a failure at eating right because you know you've been eating too many desserts - it's time for a heart change. Heart changes lead to life changes. Let's decide to get back to the reasons our grandparents celebrated the Holidays ~ Thankfulness and worshipping Christ. Let's spend time teaching our children to give thanks . . . it is not just limited to one Thursday in November . . . it should be happening each day of our lives. How about this one? How about we turn the focus of Christmas back to Christ?! How about we choose to spend the month of December with our children teaching them not only about Christ's birth ~ but about His life, death, and resurrection. Can we be like the Shepherds from Luke 2, who searched for the Christ Child? They found Him and their lives were changed. Join me in searching for Christ this Holiday season. Let the wonder and the joy of His birth infuse our lives with awe. May we rejoice and glorify God for all He has done. May we do something not only for ourselves this week, but also for others. May we listen for the Spirit's gentle calling and share love and joy with our words and actions. May this be the season of Joy, of Love, and of Christ. Let's get back to CHRISTmas, in our hearts, and with our celebrations. 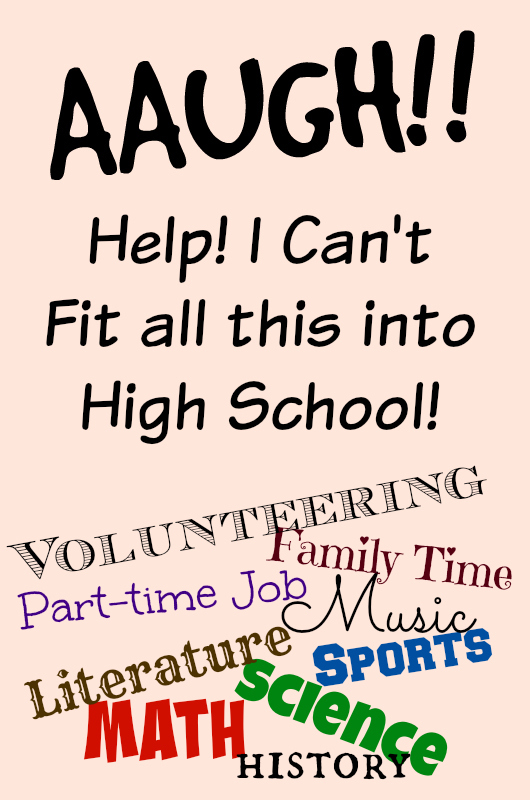 When you think of scheduling High School do you run around the house screaming AACK!, AAUGH! or something similar? Looking at a layout of High School classes for your student may not be what sends you running, but often we get tripped up by fitting those courses into our already full lives. Here is a valuable tip ~ They won't do it all. Even with all the well-meaning books, college-prep websites, and heart-felt blog posts telling you they can ~ your student is just not going to have time to do everything. That's why you need to make sure they know HOW to learn before they graduate. 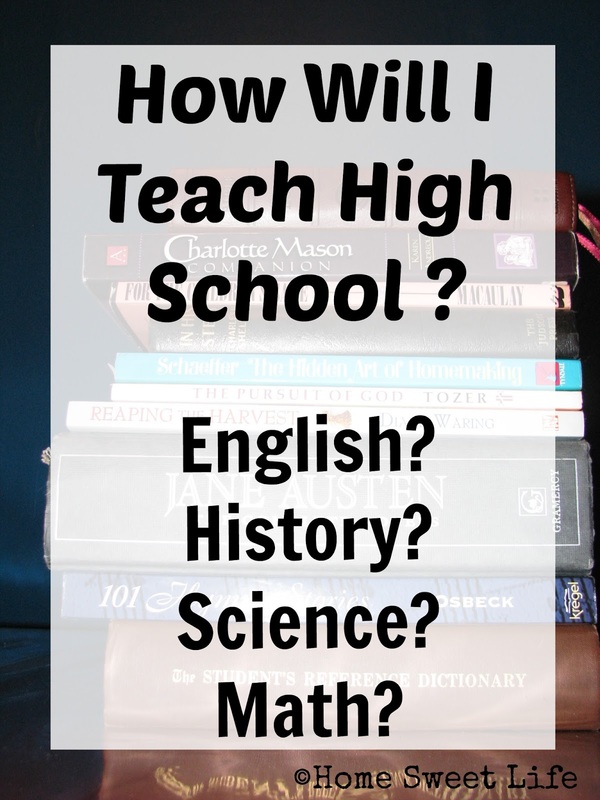 You also need to sit down as a family (Dad, Mom, soon-to-be-High-Schooler,) and talk about what are the MOST IMPORTANT things for your student to learn during their four or five years of High School. Stop trying to be just like everybody else. What does God want YOUR student to study? Then that is where you begin. Choose a path for success in life, not just to get into a certain college or to pad a transcript. If you and your student think they are going to be called into a field that requires college, by all means - make sure they have the necessary classes. Then look with care at what else they invest their time on during the High School years. If it is necessary for your teen to have a job during High School, you'd better make sure they understand time management, or they'll never finish Algebra 2. If they want to play a musical instrument - same thing - time management. In fact, whatever your student wants to do - teach them time management! Teach time management early and teach it often! If you yourself struggle with time management, now is the time to buckle down and learn to plan your own days better. Set an example, or learn alongside your student - either option works, but this is a skill that simply must be taught. What if your student isn't planning on college? Talk about careers they might enjoy. Help them out by exposing them to a wide variety of people and places. If you live in a rural area, you'll have to be more creative to do this - but it CAN be done. When you have some ideas about careers or interests, work on exploring those in the times around and between the core courses like math, science, and literature. Include time learning about the career and its necessary skills for electives in High School. If service to others is important to your family, then you can incorporate that into their High School career as well. Volunteering at a soup kitchen, food pantry, local museum, or nursing home are all valid uses of your High Schooler's time. Our daughters participate in a lot of what would traditionally be called extra-curricular activities. We have chosen to incorporate most of them into their High School experience, and many of them are included in their transcripts. You do need to be a little creative at times figuring out where to assign the credit, but it can be done. History that they learn and share with others is history they will not forget. Working on a community project for Civics class teaches them about group dynamics, and government in action. How have we fit in what is important to us? By thinking outside the traditional 7:30 a.m. to 2:45 p.m. timeline. Our girls usually don't start their schoolwork until around 8:30 a.m. They work on each day's assignments until they're finished. That might be 2:30 or it might be 5. Bookwork and traditional classwork are assigned Monday- Thursday. Friday was always Field Trip day when they were little, so we've continued to leave it as our open day during High School. From April through October our girls volunteer at an outdoor living history museum. This usually occupies three Fridays a month, leaving us a Friday each month for a Field Trip. We take more Saturday field trips now than we did when they were little, but we still fit them in. Each week our girls usually have at least one or two afternoon or evening events to go to - either for school, or for fun. It might be Literature Class, a choir performance, a community project, a 4-H meeting, or park night with their friends. They understand that they cannot attend the extra events if their bookwork and housework aren't completed. Wanting to spend a couple hours at the park playing Ultimate Frisbee with your friends is a big motivator for a High Schooler to finish her algebra lessons! It is important to us that our daughters learn how to complete their math and literature assignments, but it is MORE important that they learn to be doers of God's Word and not just hearers. They are learning about serving others, about sacrifice, about being a citizen that cares for others in their community. These goals require finding a balance. They require caring more about what God thinks than about what others think of them. High School can be a time of quality growth, deep conversations, and family fun. Don't try to fit it all in. Choose carefully what needs to be included, and leave your High Schooler, and yourself, some time to enjoy High School! I have great friends. Each one is unique. Each one enriches my life. They challenge and encourage me daily. They also do wonderful things like pick the girls up for an event if I'm still at work, or invite us over for dinner. The old saying is true ~ to have a friend, you have to be a friend. There is not always time to do the things for my friends that I wish I could, but there is always, always time to pray. I pray for my friends often, that God would meet their needs, and encourage them in their daily walks. If you've been blessed with great friends ~ tell them so! 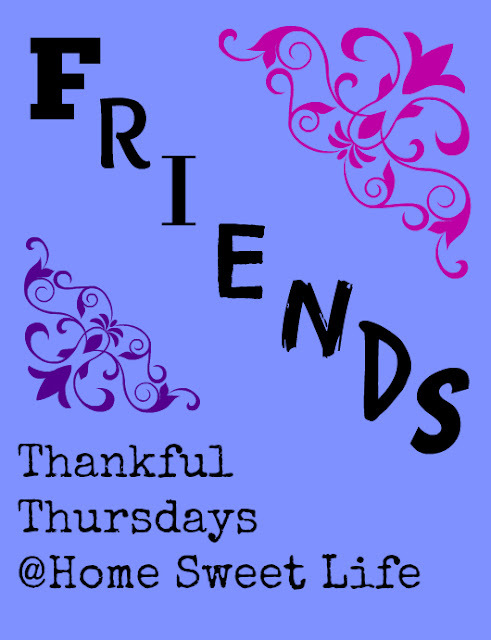 Friends are a true blessing from God! 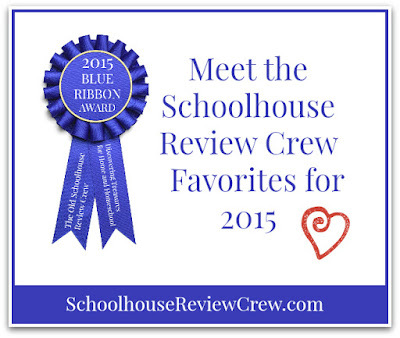 Every year, we members of the Schoolhouse Review Crew vote on our favorite products from the review year. Everyone gets to vote... even the little kids! As our family votes on our favorites, we always wonder what everyone else on the Crew loved best. Today is the day that the Crew announces the Blue Ribbon Award Winners. We're here to tell you about some of the products and vendors we voted for. 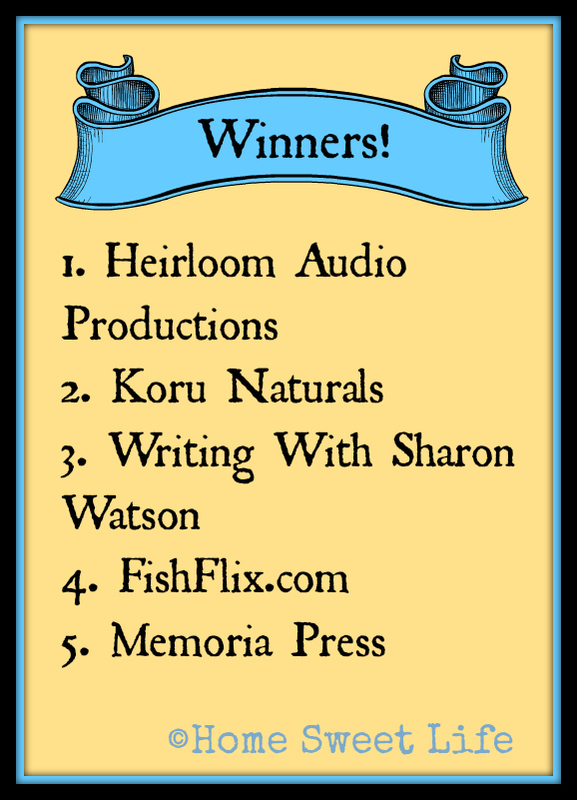 There will be a lot of posts about various families' favorites, plus the actual awards. If you're wondering about any of these products, you can visit The Schoolhouse Review Crew website and read all the reviews from earlier in the year. We reviewed two awesome titles from Heirloom Audio this year: In Freedom's Cause and With Lee in Virginia. Both of these audio dramas are top-notch productions that draw you into the story, and make you want to stay. Our whole Crew is eagerly awaiting their next release! I adore Koru Naturals! Their Emu oil and Blue Tansy Oil Cream has transformed my days. My shoulder joint is so much better after using this for the past two months! Their honey and propolis soap is a family-wide hit, and Emily and I are still using the Skin Clear Cream. Earlier in the year we reviewed their emu oil - it is such a great moisturizer, and their lanolin lip balm. Try this stuff - it's awesome! This was Emily's top vote. This year we reviewed Illuminating Literature, Mrs. Watson's newest offering. If you're looking for a way to get your High Schooler interested in Literature - choose this one! In the past, we've also reviewed her Writing Fiction in High School curriculum - also a gem. Emily not only loves the curriculum, she enjoys talking with and emailing with Mrs. Watson, who loves to hear from her students! Arlene helped me review The Book of the Ancient Romans this year. She enjoyed how it was presented as a story, instead of just a collection of facts or short paragraphs. We've reviewed other titles from Memoria Press in the past, and every one has been a solid, quality option. Whether or not you're a Classical Educator, Memoria Press is a great destination for finding educational gems! Every year, one of the categories is "Best product I didn't know I needed." For us this year, this was CursiveLogic! We loved how it helped Arlene's writing. Be sure to check it out for your family! Out of 30 reviews we've done for the Schoolhouse Review Crew just this year, these 5 vendors comprise eight of our favorites! Want to know who won the overall awards? Click on over! It has been a while since we've posted a Thankful Thursday. Life has been full. We've been finishing up a lot of reviews, and we took little vacation. We went to the beach. We are all really thankful for a few days at the beach. 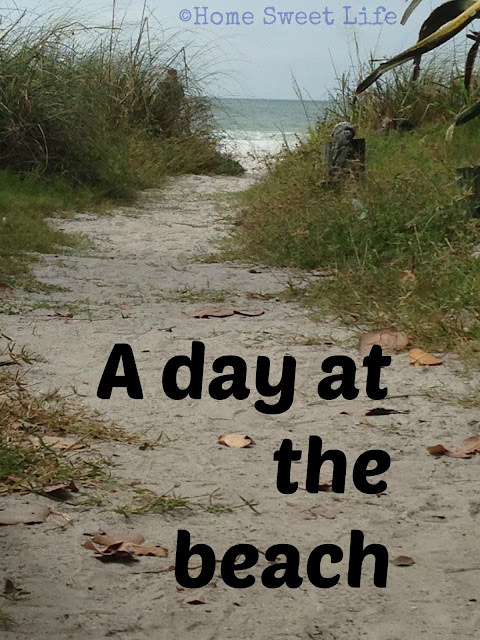 Perhaps the reason why a day at the beach is so relaxing to me is the loss of perception of time. At the beach I don't glance up and see the minutes ticking away. At the beach I can be completely in the moment. Our camera card is full of photos from the beach, among other places, and eventually we'll get them all sorted out. You'll probably notice a lot of beach photos on the blog in coming months. They'll be there for you to enjoy . . . and as a reminder to me to just be. Many parents shudder when they think of teaching High School subjects at home. Maybe it's the whole idea that your little children are now teenagers, or maybe you're just dreading a particular subject that you didn't do well in yourself. Whatever your concern, we're here today to let you know teaching High School at home doesn't have to be scary. If you've been teaching your children at home , it helps if you spend part of the Middle School years helping them transition to being independent learners. With each child this works differently. Your goal should be that they can at least begin or end each lesson by themselves. If you've been very hands on as a teacher, use these Middle School years to start letting go and letting the student have more responsibility. Don't plan to lecture-teach during High School, you will set yourself up for disappointment, and your student for boredom. High Schoolers should be working on learning the material themselves, not being spoon-fed. I truly think that Homeschooling High School is easiest if you've been following a Charlotte Mason, Classical, or Unit Study approach. Though High School can be taught at home with any teaching style, you'll want to make it as easy on you - the parent/teacher as possible. Some parents have concerns about a specific subject. What if you did poorly yourself in Math or English? Good news ~ you can either learn alongside your student or find another teacher for that subject. Co-ops are popular around our area for High School because the parents who feel confident in higher level Math, Science, or English can teach those classes while their own students learn from someone else in other subjects. We have not been involved in traditional co-ops during High School, yet I know several friends who say they are a great boon for them. For those who aren't part of a co-op, or who are still unsure what to do for a particular subject, start researching. There are a wealth of options for online or DVD based courses. If a particular subject makes you cringe, budget yourself some extra money for that subject. If you're a pro at English or Art you can do more of the work in that subject with your High Schooler from a less expensive resource. English can be taught completely from books available at our local library. Check your own library to see what resources are available in your area. For our own daughters, I could have taught them their High School math myself from an older textbook. Instead, we ended up using online and DVD-based courses for them. We had reviewed these course with The Schoolhouse Review Crew and they worked so well for the girls that we had them continue with them. Arlene understood Algebra well using Math-U-See's curriculum, so we ordered their Geometry for her to use as well. Emily has used VideoText Interactive's Algebra (a complete level 1 & 2 course.) I am still available to help explain any concepts that the girls get stuck on, yet I have more time available for other things they need me for. 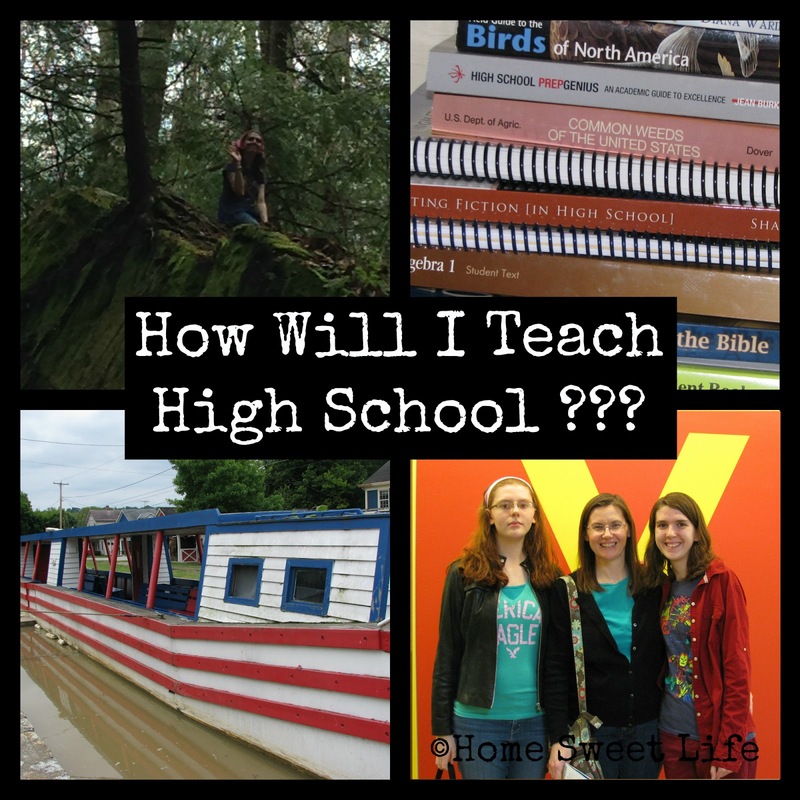 High School is a four or five year experience for most homeschoolers. Before you begin Homeschooling High School you should spend some time finding out about your state's requirements for a diploma. How much of each subject is required? How are credits recorded in your state? In our state each semester is recorded as a credit, whereas most states give a half a credit per semester. Also talk with your teens about their goals for after High School. If they plan to attend a college or trade school, you'll want to make sure they are covering the correct subjects in the necessary amounts. If your student is wanting to do an internship or take dual-credit classes you'll need to plan for that as well. 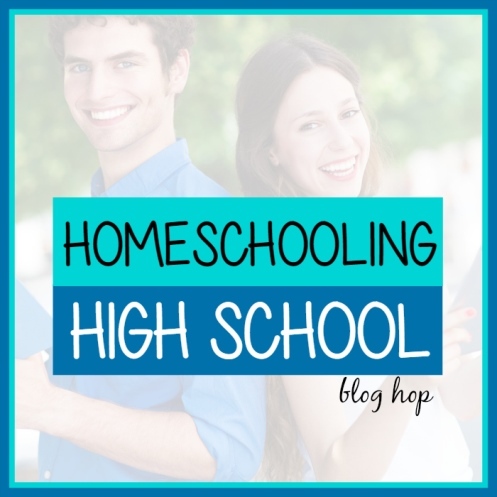 High School can be a great time to homeschool. The conversations you can have with your children are so much more varied and surprising. Your students can amaze you with how much they understand, and how much they need to talk to you! It can be challenging to have High Schoolers, sometimes their internal clocks are so very different than the rest of the family's. Work with some boundaries, and some freedom, on this part of the planning. Some days they just need to sleep in, but they also need to know how to fit in when they get a job with set hours. Require them to complete their assignments. Encourage them to always do their best work, but be ready to help them when they struggle. One last thing . . . your homeschool during High School should be unique for your family just like it was when your children were younger. Think outside the box. Use a variety of resources. Watching a history documentary while exercising or listening to an ebook while cleaning the house can be just as valid of a part of an education as reading a textbook. You cannot cover everything, but you do want to make sure to cover those essentials needed for a diploma. If you're wanting to read some more about our out of the box learning, pop on over and read here, here or here. Our friends have been sharing about their Homeschooling High School experiences. Click on the links below to read their stories! Michele at Family, Faith and Fridays shares on How Then Should I Teach?